Outside many Sunshine Retirement communities across the country, residents are enjoying the vivid yellows, reds and oranges of fall. Inside, they’re excited about a different fall color: Bright pink. 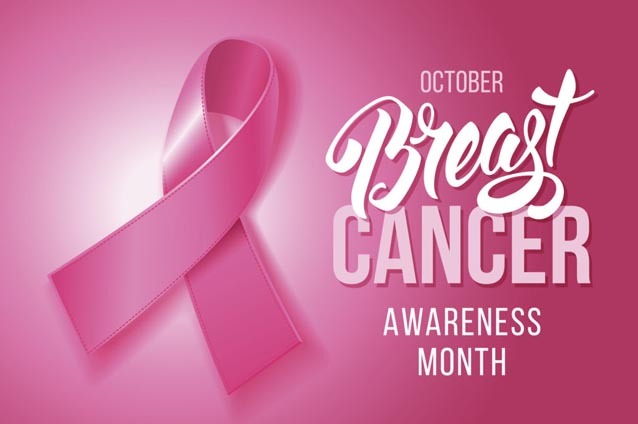 Ever since National Breast Cancer Awareness Month (NBCAM) was introduced to the world in October of 1985, pink has become a favorite color for clothing and accessories worn by everyone, including entertainers, professional athletes, politicians and of course, breast cancer survivors. The annual campaign was organized by major breast cancer charities to increase awareness of the disease and raise funds for research into its cause, prevention, diagnosis, treatment and cure. The campaign also offers information and support to those affected by breast cancer. From the outset, the aim of the NBCAM has been to educate people about the importance of early screening and to promote mammography as the most effective weapon in the fight against breast cancer. In the fall of 1991, the Susan G. Komen Foundation handed out pink ribbons to participants in its New York City race for breast cancer survivors. Shortly thereafter, Evelyn Lauder, Senior Corporate Vice President of the Estée Lauder Companies, founded The Breast Cancer Research Foundation and established the pink ribbon as its symbol. And pink has been popping up everywhere ever since. Every October, a variety of Breast Cancer Awareness events are scheduled throughout the world, including walks and runs, and the pink illumination of landmark buildings in countless cities. In the United States, the National Football League promotes breast cancer awareness by incorporating pink on and off the field. And even comic strip artists use pink on one day this month. Within the world of Sunshine Retirement communities, there are several acknowledgements of Breast Cancer Awareness, including one at Summerfield Estates in Tigard, Oregon, where they commemorated the month with their “Pink Is the New Black” Breast Cancer Association Fundraiser Social & Sale last Friday. Meanwhile, at Country Club Village in Hot Springs, Arkansas, NBCAM has a special significance to no less than six residents who have been diagnosed with the disease. Office Manager Angela Ring has ordered pink t-shirts for the ladies and she and her staff will be running in the Race for the Cure in Little Rock on November 3. Resident Joy Russo is currently going through treatment for metastatic breast cancer, which means the cancer has spread beyond the axillary lymph nodes. Despite the prognosis of requiring treatment for the rest of her life, she has gotten through with persistence and a lot of family support. “I am not a survivor,” says Joy. “I’m a thriver.” Joy strongly encourages women be vigilant and get their mammograms early to give themselves the best chance of survival. After getting out of the shower and detecting a lump on her breast, Jean Gade was diagnosed in 1976 and had to undergo a mastectomy. Thankfully, she has been cancer-free ever since and recommends reconstructive surgery to anyone in need of a mastectomy. A routine mammogram detected Dorothy Shaw’s cancer in 1991. She had a lumpectomy, went through radiation treatment five days a week, and needed cancer medication for six years. Yet with the help of her husband and inspiration of her children and grandchildren, she made it through and even was up driving within two days of surgery. Now at age 94, she doesn’t give much thought to being a survivor, though she knows that she is blessed. Carolyn Fletcher had a much easier time when diagnosed in 2003. She had radiation treatment and a lumpectomy, but was extremely fortunate. Carolyn’s family was also a great support system. Wanda Chastain’s maternal grandmother died of breast cancer as did her oldest sister at the age of only 48. But she wasn’t about to give in easily when diagnosed in 1993 through a doctors’ routine exam. She had a lumpectomy and lymph node surgery with reconstruction, which still gives her discomfort every day. She also had an allergic reaction to the medication, which she believes would have killed her if her daughter had not been there. In addition to cancer, Wanda fought her way through a heart attack, a stroke and back surgery that put her in a wheelchair for six months. She owes a lot to family and friends. Some family history with cancer also encouraged Donna Belyeu to get a mammogram and probably saved her life. For years, she always refused the mammogram at her annual check-up. But after she lost her son to testicular cancer in 1988, she changed her mind. Luckily, she didn’t have to go through any treatments, but made it through by taking meloxicam for five years. We at Sunshine are very grateful to have many breast cancer survivors still with us today. And by supporting the cause of NBCAM, we expect to keep countless other residents “in the pink” for years to come. This blog was first published here: Sunshine Retirement Living, October, 2018. Some information provided by Wikipedia.com.